Grand Final History: How Often Does The Better Team Win? The VFL competition had no Grand Final in its first season, so it wasn't until 1898 that Essendon were able to establish a most unwelcome first: the inaugural losing favourite. For today's blog I've once again drawn on the All-Time Team MARS Ratings (including the recent correction in which I assume that the home team in any Final is the higher MARS Rated team), using them to determine the favourite in every Grand Final and to make a number of other observations about the quality and composition of the GF in every season. This first, thumb-nailed table shows the details of all 114 Grand Finals in which a winner has been determined, and of the 3 drawn Grand Finals. There is, quite obviously, a great deal of information in that table, the majority of which I'll allow you to discover in your own time and with your own level of alacrity. The left-hand block of columns in the table provides information about the team that went into the respective GF with the higher MARS Rating, while the middle block provides the same information for the team going in with the lower MARS Rating. In the next, lone column, the difference in the MARS Rating of the winning team relative to the losing team is recorded. Red numbers in this column flag an "upset" then, at least in terms of MARS Ratings. On the right-hand side is the final block, which provides information about whichever team finished the season with the highest MARS Ratings, regardless of whether or not they played in the Grand Final of that year. In this section you can track the year-to-year changes in the identity of the highest Rated team in the competition. There, for example, you can see that Carlton were the first team to hang onto the title of highest Rated at season's end for more than two years straight. In fact, by the end of their run in 1910, they'd held the title for five years in a row, though they won the GF in only the first three of those years. 1914 saw the first Grand Final in which neither of the two highest Rated teams in the competition participated. Instead, the 3rd-best team (Carlton) prevailed over the 7th-best (Sydney - or South Melbourne, as they were known then). Two years later, in 1916, Fitzroy won the Flag while Rated only just over 1,005, establishing them as the lowest-Rated winner of all-time. In the next year Fitzroy established another all-time record in being the only team to play in a Grand Final while Rated under 1,000. In that year they lost, to Collingwood, by 35 points in the Grand Final, having finished 4th of six teams at the end of the home-and-away season, before defeating Carlton in the 1st week of the Finals and then Collingwood in the 3rd week. Under the Finals system in force at the time the Pies, as minor premiers, were entitled to a repercharge Grand Final, which they won. Much later, Hawthorn held the top Rating position at the end of six of seven consecutive seasons from 1983 to 1989, making the Grand Final in each of those seven years and winning four of them. Then, in 2008, Geelong became the highest-Rated team to lose a Grand Final, setting the all-time record for MARS Rating superiority in a losing cause at the same time. Here's a table containing this, the biggest ever Grand Final upset, and the 14 next biggest across history. Note that all 15 of the losing Grand Finalists in these upsets finished the season as the highest Rated team. The fact that the 15th-biggest upset sees a difference in the winner's and loser's MARS Ratings of only 10 Rating Points (RPs) hints that significant Rating mismatches in Grand Finals are probably rare. This next chart, which plots the game margin from the viewpoint of the higher Rated team against the MARS difference, confirms that suspicion. The scarcity of Grand Final mismatches is demonstrated by the sparseness of points on the extreme right of this chart. Upset results, which are less rare, are those sitting in the bottom half of the chart, below the zero point on the y-axis. Most of these upset results are huddled near the y-axis, which reveals that these results were only slightly unlikely, in that the MARS Rating of the winning team was only 5 or so RPs less than that of the losing team. As you might expect, there is a vaguely upward and to the right trend in the points shown here, reflecting the fact that the larger the Ratings superiority of the stronger team, the greater its victory margin. The fit is by no means perfect, but the R-squared is about 30%, which suggests that it's due to more than simply chance. Another way of demonstrating the similarity of team Ratings in most Grand Finals is to calculate the average Ratings difference between the winning and losing team, and between the stronger and the weaker team across all Grand Finals. Those statistics - about 4 RPs and 11 RPs respectively - appears in the following table, which provides this and a variety of other summary statistics for eight eras, each of about 15 years in length except the 1st era and the most-recent era, which include only 13 years. From this table we can gauge the overall success of "favourites" in Grand Finals: higher-Rated teams have won only 67 of 114, or a bit under 60%, of Grand Finals. We can also measure the success of teams that were highest Rated at the end of the respective seasons. Almost 90% of such teams have played in the GF in the year in which they finished highest Rated, and 65 of them, or about 57%, went on to win that GF. The average MARS Rating of the successful Grand Finalist has risen for each of the last four eras, adding about 15 RPs across that time. During this same period, losing Grand Finalists' average Ratings have risen by about 11.5 RPs. As a result, the average difference in the Ratings of winning as compared to losing Grand Finalists has reached an all-era high in the most-recent era. It's been almost 8 RPs in that period. A very similar pattern emerges if we instead focus on the average Ratings of the stronger and the weaker team in each Grand Final. Stronger teams are now, on average, about 17 RPs stronger than they were in the 1940 to 1954 period, while weaker teams are about 9 RPs stronger. So, here too the increase has been about 8 RPs. At the far right of this table there's information about the end-of-season MARS Ranking of the eventual Flag winner. Almost 60% (ie 65 of 114) of winners have finished the season as the highest-Rated team, and about another one-quarter have finished the season as the second-highest Rated. In total then, one of either the highest or the second-highest Rated teams has won the Flag in about 85% of the seasons in which there's been a Grand Final. The lowest-Ranked winner of all-time was Melbourne in 1900, who won the Flag yet finished the season as only the 5th-highest Ranked team. They finished 6th at the end of the regular home-and-away season before negotiating what were called Sectional Rounds, emerging at the end of these as the top team in Section B with a 2 and 1 record. They then squeaked by Essendon by 2 points in the sole Semi Final before triumphing by 4 points over Fitzroy in the Grand Final. Just three teams have won a GF but finished the season as only the 4th-highest Ranked team, the latest being Adelaide in 1997, who toppled the Saints despite giving them a Rating advantage of over 16 RPs in the final game of the season. In the current era, no team has won the Grand Final and finished the season Ranked lower than 3rd: in 2005 Sydney finished 3rd-highest Rated after defeating the 4th-highest Rated Eagles. To finish, here's a team-by-team summary, providing counts of how often each team has been the higher Rated team in a GF but lost, the lower Rated team in a GF but won, and the highest Rated team at the end of the season but failing to make the GF at all. 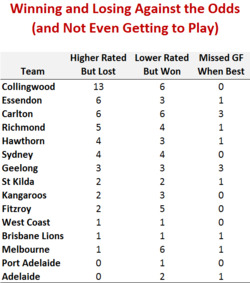 Collingwood, for the worst reasons, are the stand-out team in this table, having been involved in 13 Grand Finals where they've entered as the higher-Rated but emerged Flagless. No other team has achieved this even half as often, the next-closest being the six occasions recorded by each of the Dons and the Blues. On the positive side, the Pies have also gone into six GFs as the lower-Rated team and nonetheless prevailed, a record that they share with the Blues and the Dees. Carlton and Geelong are the only teams to have more than once missed the Grand Final in a year where they finished highest-Rated of all teams. They've each done this three times. The only teams to have won at least one Grand Final despite never going into one with the higher Rating are Port Adelaide, who've done it once, and Adelaide, who've done it twice. The Crows did this in 1997 and in 1998, though on the second occasion, so close was their Rating to the team they defeated, the Kangaroos, going into the GF that the RPs they earned from the victory moved them ahead on MARS Rating of the team they vanquished.